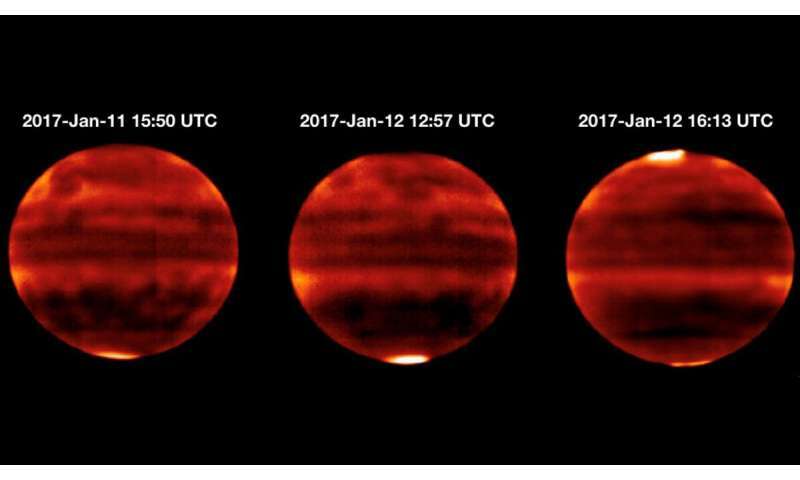 "What is startling about the results is that we were able to associate for the first time the variations in solar wind and the response in the stratosphere—and that the response to these variations is so quick for such a large area," said JPL's Glenn Orton, co-author and part of the observing team. 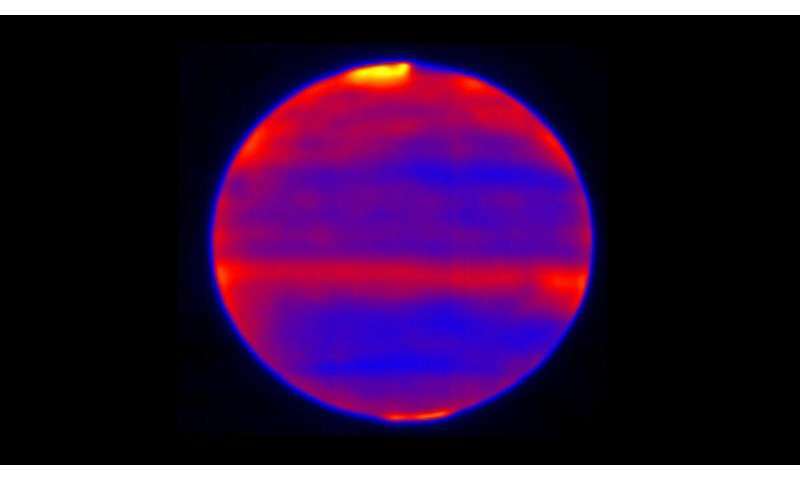 The telescope's Cooled Mid-Infrared Camera and Spectograph (COMICS) recorded thermal images—which capture areas of higher or lower temperatures—of Jupiter's stratosphere. Well what do you know? Solar activity can heat a planet. Even though the TSI drops during solar storms temps can go up. I bet this doesn't change a thing with the AGW acolytes. Hmm, solar winds can heat up the atmosphere... so much for man made global warming. This will never hit the mainstream news and will be ignored by the eco nazis. Lets sweep this under the rug asap. What crap media, no mention of actually 'how much' the temperature rose. The southern auroral CH4 emission increased in brightness temperature by about 3.8 K between 15:50 UT, 11 January and 12:57 UT, 12 January, during a predicted solar-wind compression. jonesdumb, you have yet to explain how the TSI is relevant when it has been shown the TSI drops .3% [three times the variation of the complete solar cycle] during X-flare events, for example. Given the above observation that SW directly affects atmospheric chemistry and temperatures it seems moronic to rely entirely on TSI as the only solar related factor to model the Earth's climate. Because, you clown, this is long term climate, not an 11 year half cycle that has been occurring for billions of years. Has the solar activity increased since the industrial revolution? Lessened? Stayed the same? It is very closely monitored. If it is heating parts of the atmosphere now, it was also doing so 100, 1000, 10 000 etc. years ago. Lern to scienz. Has the solar activity increased since the industrial revolution? Yes, as a matter of fact it did, it was called the solar maximum which has come and gone. You know that pause, that was the peak and we are on the way back down the chart. And temperatures are still rising, which kind of screws that observation, doesn't it? Only the cherry picked ones, and those that are "adjusted". Is that all you've ever got, you pathetic oaf? Every single time one of your dogmatic beliefs takes a kicking, it's all to do with a conspiracy, or fixing the data, etc. You really are pathetic, particularly given the unscientific crap you believe. "adjusted" is AGWism for "cooked". Thus, you get man-made..er...excuse me...AGW Cult warming. Gee, the article says aurora on Earth doesn't penetrate deeply into the atmosphere; on Jupiter apparently it does. So much for the AGCC denier fest. Maybe you should read the damn article. Now the planetary astrophysicists are in on the cunspirasy. It's all the siensetis; burn them! What a bunch of nutjobs these deniers are. Next up: black holes are causing teh globul waraming. I see you're still one of the 'weaponised stupids' being played for stooges by Russian/GOP/Fossil troll-factory puppet masters. Sad. In terms of the Earth's aurorae, we are basically talking about heating of the thermosphere. All layers of the atmosphere are coupled, heat and energy doesn't just enter to a certain layer and stop and dissipate without effect. The Birkeland currents that transfer this energy wrap completely around the Earth, like a tennis ball in a sock. It is well understood the ionosphere is coupled to the surface, through the various layers of the atmosphere. The heat/energy is delivered Earth's entire electric circuit. Well, you've never got any science, so it's all that you're left with. Clearly the irony is over your head. Whoosh! Which irony would that be, woo boy? I discuss how the TSI is but a fraction of the energy which the Earth receives from the Sun, you know, science. You know, when thousands of scientific papers say you're wrong, and you claim the scientists are faking the data, that's a conspiracy theory. Science is not a popularity contest nor is it an example of the democratic process. Those thousands of papers are fundamentally flawed as they don't include all of the energy received by Earth. And the "scientists" readily admit to adjusting the historical records, no conspiracy just truth. I discuss how the TSI is but a fraction of the energy which the Earth receives from the Sun, you know, science. You however are discussing Putin conspiracy theories and other such nonsense, not science. I don't troll, mate. I objectively observe and comment accordingly as indicated based on my interlocutors' own posts/baits/trolls etc. You are the one baiting and trolling, insulting, claiming conspiracies, @cd. If you can't see that, then there is no hope for your returning 'sane and safe' from 'conspiracy land'. It's your political/religious motivated denialist drivel that marks you as a Russian/GOP/Fossil troll-factory stooge, mate. Else don't keep cluttering the threads with such obvious unscientific denialist crap, and I won't need to confront you with same. Science is not a popularity contest nor is it an example of the democratic process. No, it involves having to actually understand the science. You don't. Any of it. Another pointless post, why are you even here you crankpot? Nothing pointless about it. Just pointing out that you are scientifically illiterate. As most people already know. And I think you'll find that you are the crackpot, by definition. You are an EU cultist. Goes with the territory.